For as long as humans have traded goods, there have been various forms of shipping. Whether on foot, by horse and even in one case when the US tested delivery of mail by rocket. Freight forwarding is a modern twist on one of our oldest practices. It’s using the best of modern technology, logistics, and infrastructure to combat rising prices to ensure quick, affordable and reliable delivery of products to nearly any destination on earth. This short guide will break down how freight forwarding works and how it can help you improve aspects of your business and perhaps even some of your own needs. These days, the vast majority of goods ship across oceans in gigantic freighters. This massive ship contains products from all over to the world going to countless destinations, but by bundling together, it drastically reduces the overall costs for a significant leg of the journey. Besides shipping via ocean, freight forwarders use other means like land, air, and sea. To coordinate all these different shipments and ensure they get to where they need to go business use freight forwarding. 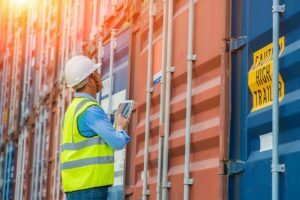 Freight forwarding companies keep track of each container and, in some cases, each box to make sure the parcel arrives safely to its final destination. The process requires specialized coordination, which is no easy task as some of the largest container ships may carry up to 15,000 boxes. Let’s say you place an order online for a product. Once you set that order and it is packaged and shipped, the product goes through different mailers, shippers, and drivers. It will likely change hands numerous times as it makes its way around the world in cargo containers depending on the warehouse and where the final destination is. Freight forwarders keep track of the entire logistics process along the way. With modern technology, they can even keep you informed via the Internet so that you can find out where your shipments are at any given time. Freight forwarding is a whole lot more than a few guys with a truck. To move your package from one port to the next, each forwarder must be licensed in each country, state, and district and fulfill licensing agreements for a whole range of other requirements. Not only that, they need to able to consolidate all customs duties, import and export declarations, and act as authorized agents for the customer. In short, they do all the complicated work to ensure that packages arrive smoothly to any given destination. They are not just movers, but the managers responsible for moving billions of dollars of products daily. Whether you are a small, medium or even large business, international shipping is the key to opening up to a much larger audience. With a solid freight forwarding team, you can expand your business and effectively scale. From air to ocean freight forwarding, you can ensure your products reach your customers no matter where they are.